Editor’s note: This post is from three of the 5 students from Amalie Skram high school in Bergen, Norway, who were chosen to join the REGIMES Team in Longyearbyen, Svalbard August 7-11, 2017. After a brief night’s sleep, we were ready for our second day in Longyearbyen. With a full schedule ahead of us, we arrived at the Governor’s office early in the morning. We were lucky to get the opportunity to talk to the governor of Svalbard about the climate changes they’re experiencing in the area. When we reached the building, we were welcomed by the governor, also known as Sysselmannen, and her legal adviser. At the meeting, we received a standard presentation about Svalbard, with the opportunity to ask questions as we pleased. The presentation and the governor’s response to our questions, made a good impression to start the day with. We got the feeling that the residents on Svalbard value their environment and nature, and want to protect it. Because of the way climate change affects their lives directly, they can easily spot the changes in the environment, as time goes by. We also got new views on the local community, and how the multicultural society lives together in harmony. It seems as though both the local community and the government wants to keep Svalbard as a low-tension community. 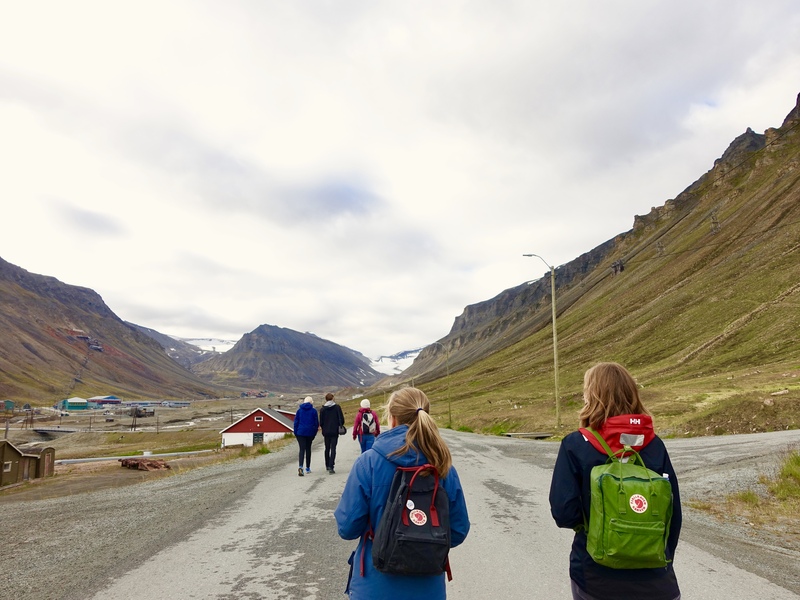 After the meeting with the Governor, we walked to the primary- and high school of Longyearbyen. As we walked, we admired all of the surrounding mountains. We noticed that they are almost ripped of all vegetation, except some small flowers and patches of grass, probably due to the cold climate. On the mainland in Norway, these kind of mountains only appear when you are located at least a thousand meters above sea level, so we kept thinking that we were walking thousands of meters above the ocean. Being busy looking at the mountains and following the rest of the team, the school seemed to appear out of thin air. 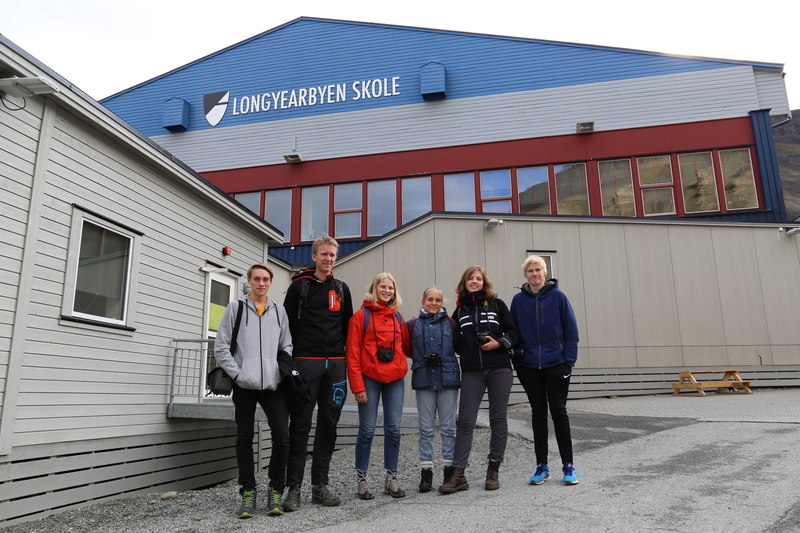 The school in Longyearbyen is a primary-, secondary- and high school combined. After they let us into the building, we had to once again take of our shoes. 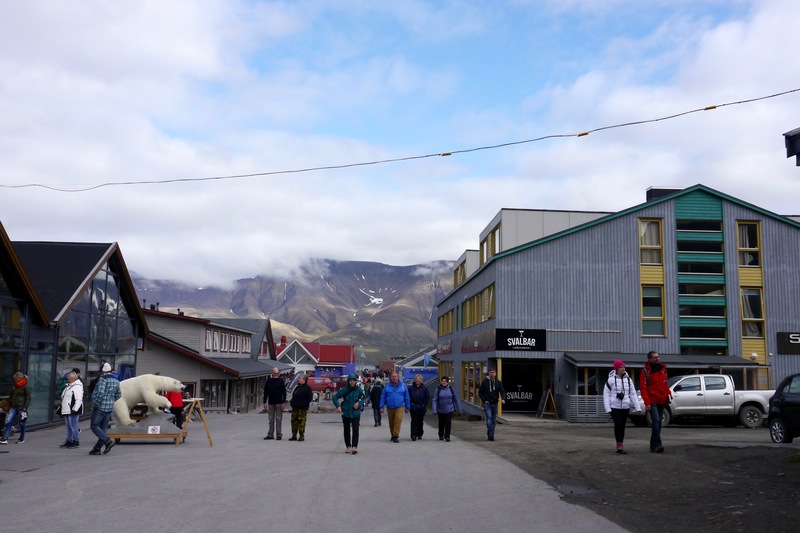 (In Longyearbyen, everyone have to take off their shoes almost everywhere one has to go inside; even at restaurants and hotels we cannot keep them on because of the amount of dirt they collect from the roads here.) A woman named Anne, who had lived here for eighteen years, showed us the three different parts of the facility. Once we got to the high school section, she told us that there were only thirty-seven pupils at the entire high school. Since there are such a low number of pupils at the school, she explained that they often thought all of them in the same room at the same time, but at different levels. She also told us that every student at the high school get their own computers for free, as a part of their educational program. The next thing we did was to interview her about how it is like for the students to get their education on such a little school as the one here in Longyearbyen, and if they experienced challenges with integrating new students into the different classes. She answered that the pupils did not seem to have a problem attending such a small school, and that in most cases, all of the students seemed to be getting along fine. The only thing that sometimes could be a little problem, was the foreign students with no previous Norwegian language knowledge. If someone came in the middle of the secondary school, Anne said that the students may have had a bit of a hard time learning the language at the beginning. She explained that the pupils got a bit of extra help in the beginning, but that they for the most part had to teach themselves the language through communicating with the other students and teachers. After the school-visit we made our way to UNIS (The University Centre in Svalbard). At the university, we had a brief meeting with a teacher and a doctorate student. At the meeting, we got some interviewing inspiration, and were getting ready to do interviews of our own. After the talk, we split into groups and started talking to the local community. We interviewed both people at the university, and people in the city center. Many people were willing to participate in the anonymous survey, and some even took the time to inform us about how life is like on Svalbard. “Humans are the greatest environmental issue on the Earth” stated one of the locals we interviewed. We soon found out that this resident of Longyearbyen had a lot to say about climate changes on Svalbard, as well as its impact on the community. The greatest consequence of climate changes he had experienced (or is experiencing), was the fact that the sea ice in Isfjorden has been extremely sparse or non-existent for almost 15 years. Continuously, we discussed the massive avalanche which hit Longyearbyen in 2015. Our interview object told us about the reaction of the local community, and also the subsequent search for avalanche-victims which 200 locals contributed to; adults as well as children. When mentioning the loss of his fellow Longyearbyen inhabitants, our interview object seemed deeply affected, as this is a small community where most people seem to know one another. From this, we gathered that climate-controlled events, such as this avalanche, can affect a society profoundly. Perhaps incidents like this can create a feeling of unity among the people of a society. If possible, we hope to discuss the incident with other locals. After an entire day of asking questions and talking to Sysselmannen (Governor) as well as other members of the community in Longyearbyen, we are under the impression that most locals care about climate change and the nature and environment of Svalbard. We are excited to continue interviewing, and we hope to find lots of new and interesting points of view.